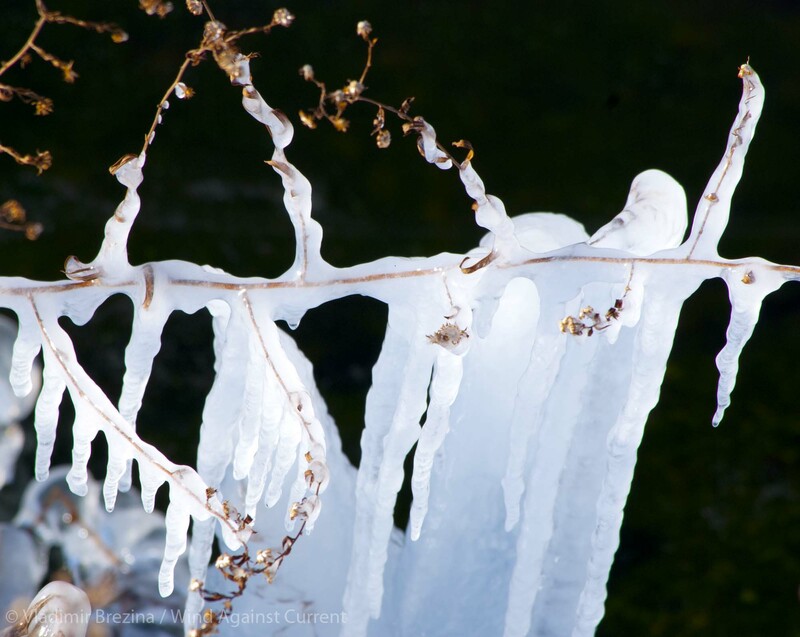 This entry was posted in Nature, New York City and tagged Central Park, Ice, Manhattan, New York City, Photography, Snow, Winter. Bookmark the permalink. Bright beautiful pictures, it’s better than mist and rain. Lovely! It was a bit chilly but a beautiful day to be outside. I went out to Sheepshead Bay to take bird pictures, haven’t put them on Frogma yet but they’re up on my Facebook page. 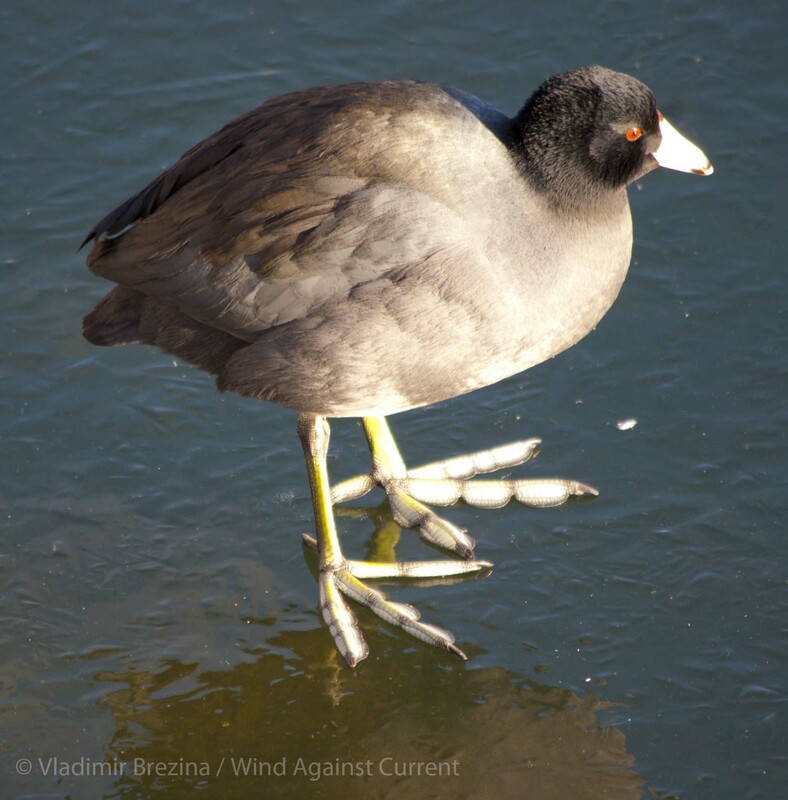 Funny what you said about fingers freezing – I took off my gloves at one point to speed up a lens change to catch some brants who were heading away from me, I put them down on a rock and forgot them, but I remembered them VERY soon! 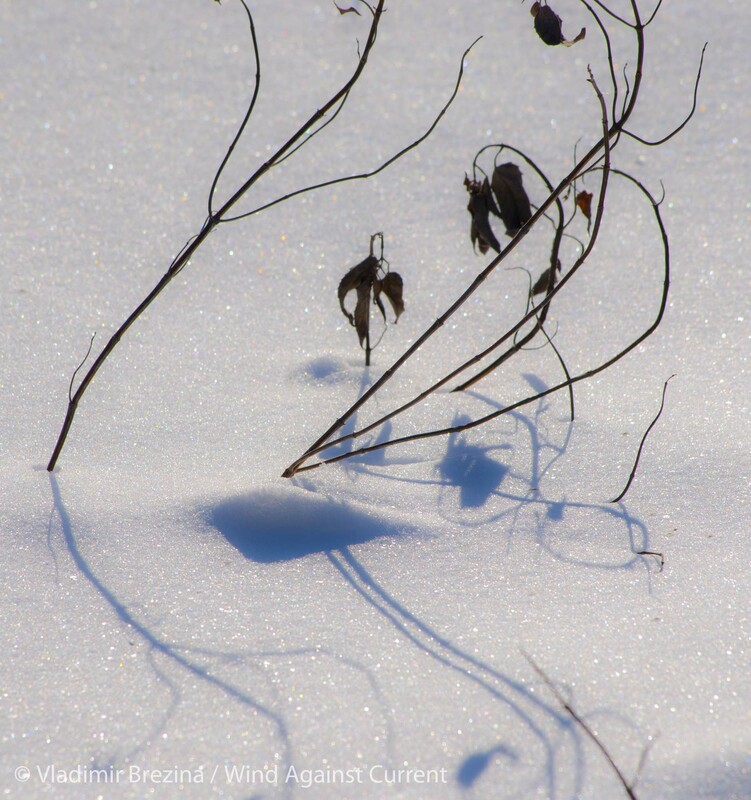 Yes, the fingers are the weak link in winter photography :-) Happy New Year, Bonnie! Ah, winter memories! 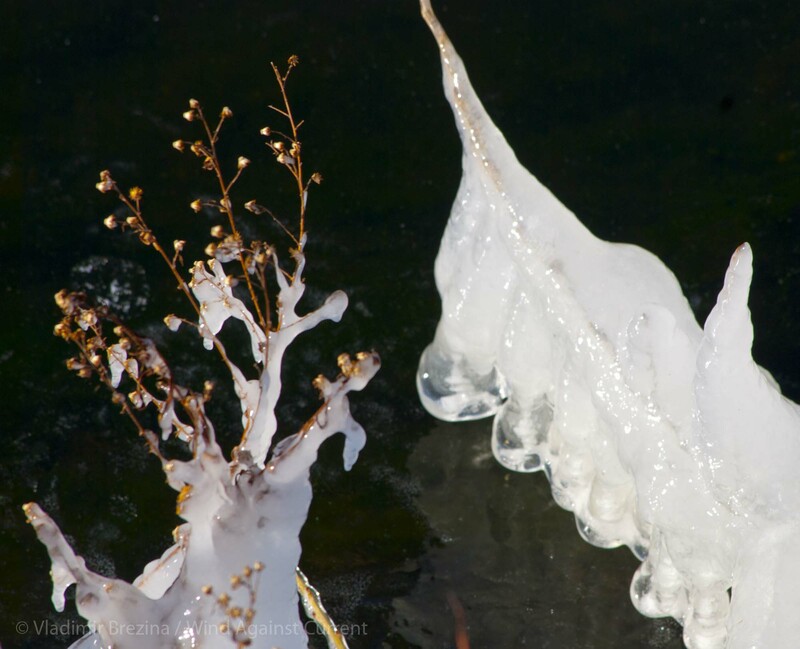 Great shots of frozen beauty. Hard to keep that finger on the shutter button in cold temps! Worth the effort though! 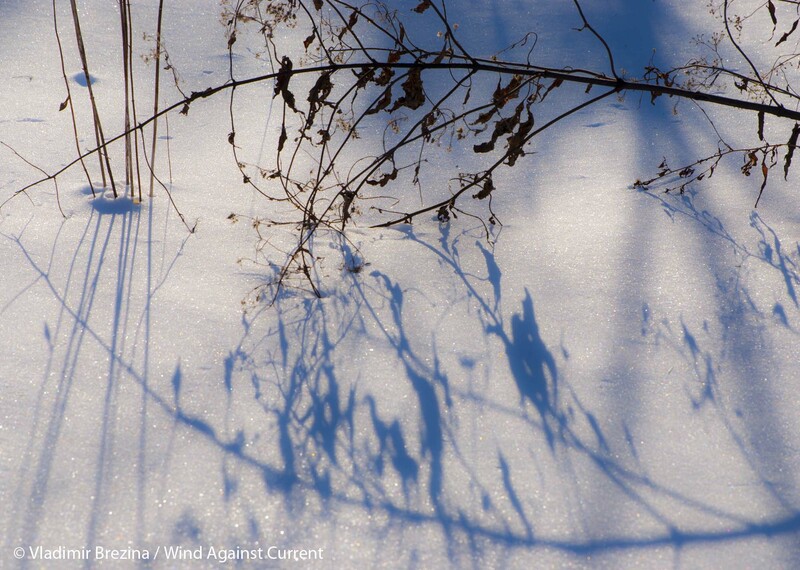 Winter can have such a beauty of its own. Wow- beautiful photos! It looks mighty cold though! Not as cold as it is about to be in the next few days… If the predictions are right, this could be quite something! I ought to take this as a reminder I still need to sort out my thermals and lined trousers – it’s still quite mild here, despite the strong winds/tides that are causing flooding in some parts. I like the exposures of the snow shots, as we have so little snow, it often takes me a couple of shoots to get my eye (and compensation) in order! I can’t figure out where the first photo was taken from. 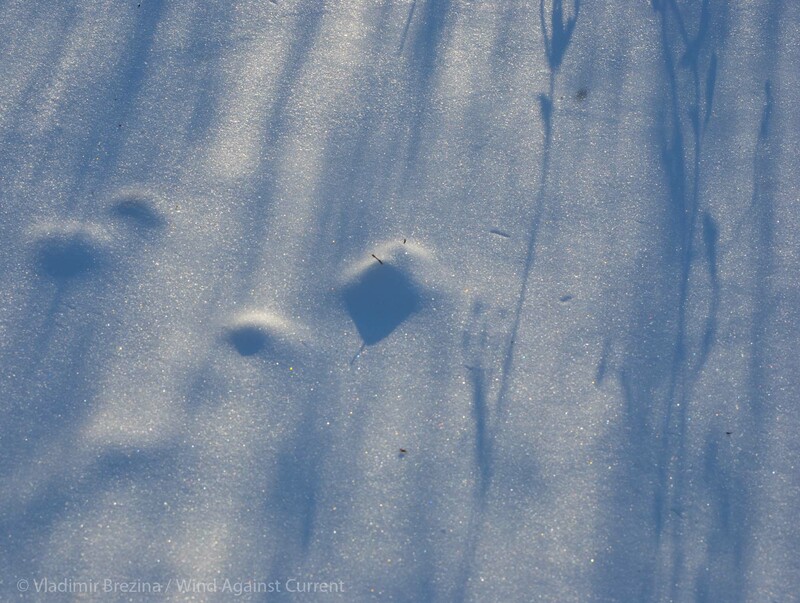 I went out to take photos too, and my fingers froze so fast, even with gloves on, I had to go back inside. Photo taken from the jogging path around the Central Park Reservoir, from pretty much the most uptown point, in the northeast corner of the reservoir, looking downtown. 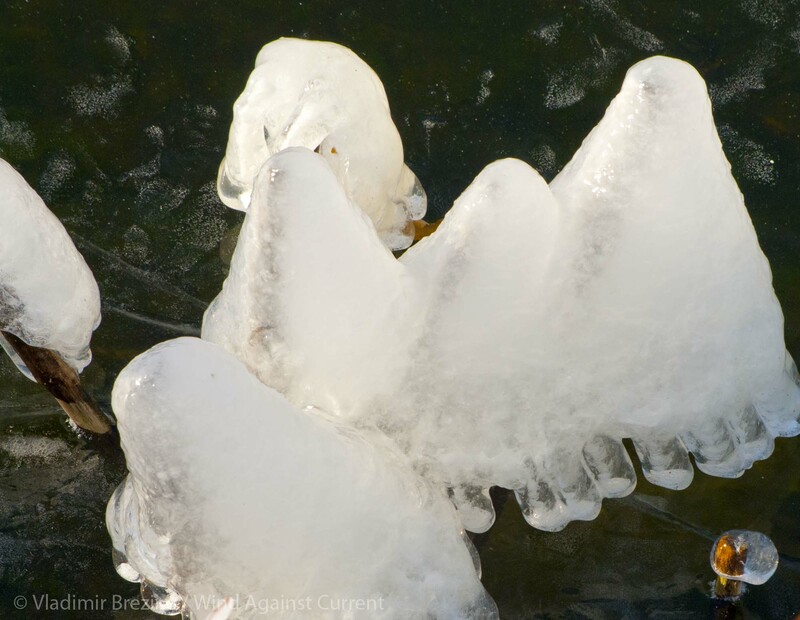 Very nice capture of the ice–they’re like mini-sculptures. Very beautiful images. The ducks look cold! Brrr! Hard to imagine it’s like that on your side of the world when we’re in the middle of summer here 😊 Lovely pics. And it’s hard to imagine here that it’s summer on your side of the world… (So they say—I’ve never been to the southern hemisphere ;-) Thanks!! Interesting ducks, indeed, guessing Northern Shoveler (Anas clypeata) based mainly on the immense bill, also the males’ plumage. Attractive, hoping to meet a few on the water some day. No rush, looks like #2 is trying to sleep off winter, we must all be patient. Ringnecks? LOL — another duck I don’t know! 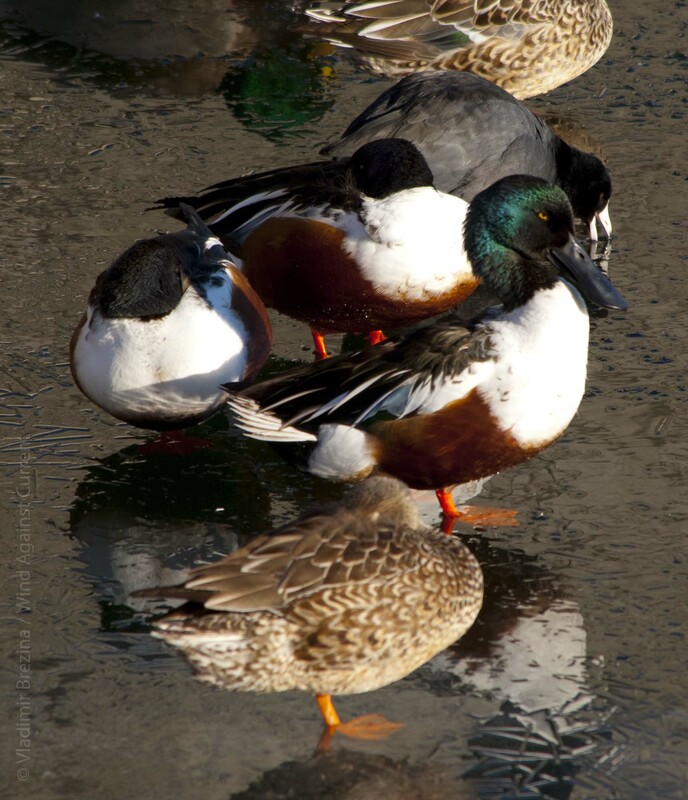 From a description, “faint brown ring on drake’s neck never shows in the field; light bands at tip and base of bill are conspicuous.” Ignoring the characteristic that “never shows in the field,” the bill in the first duck photo lacks light bands, ruling out ringnecks. They were probably dabbling elsewhere. Hint — they are “similar in appearance to scaups,” if that helps. 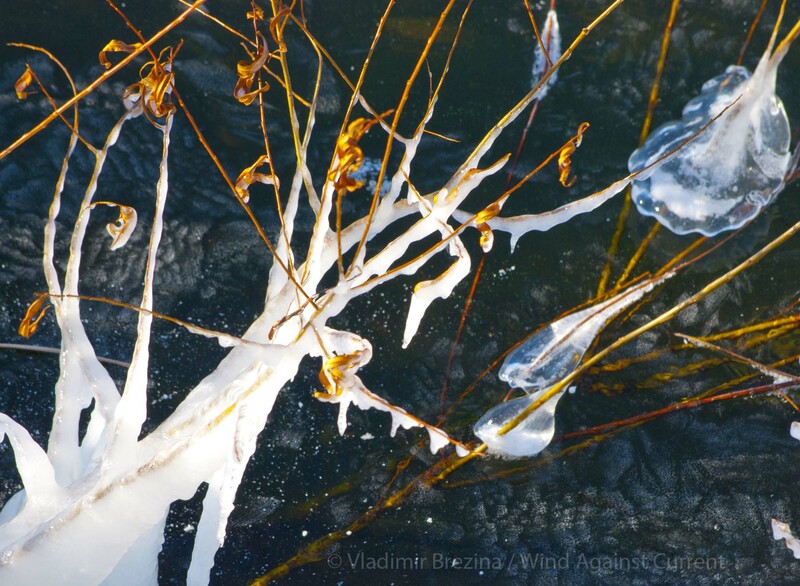 I love the photos of the ice and the water. Great shots. Magnificent. And we don’t have to suffer the cold! Ice 3 looks like a bird caugtt in frozen time…lovely wing…Can you see? 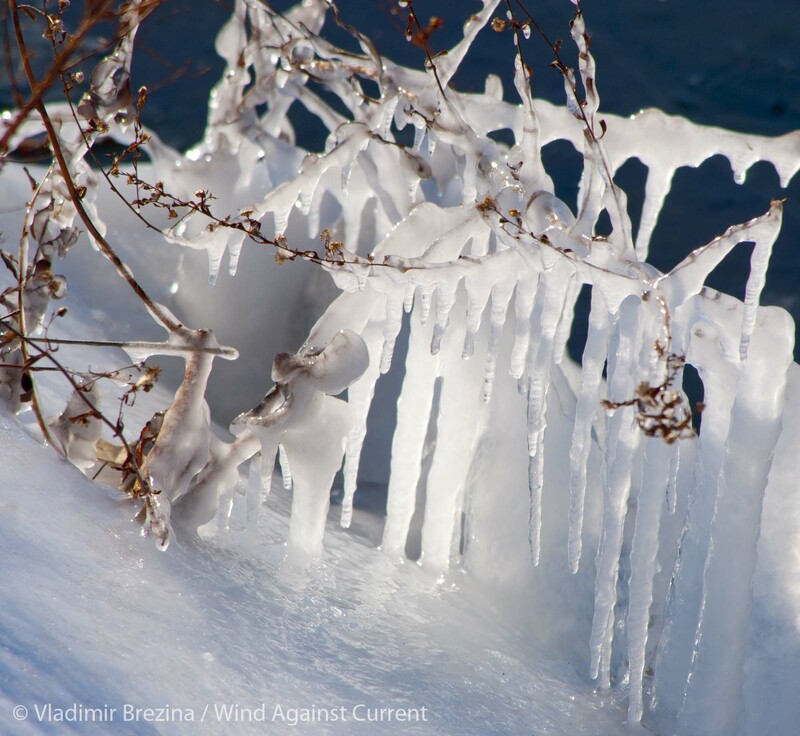 Beautiful pictures – I can feel the cold just looking at them. I feel really sorry for the wild things right now. It’s rough out there. 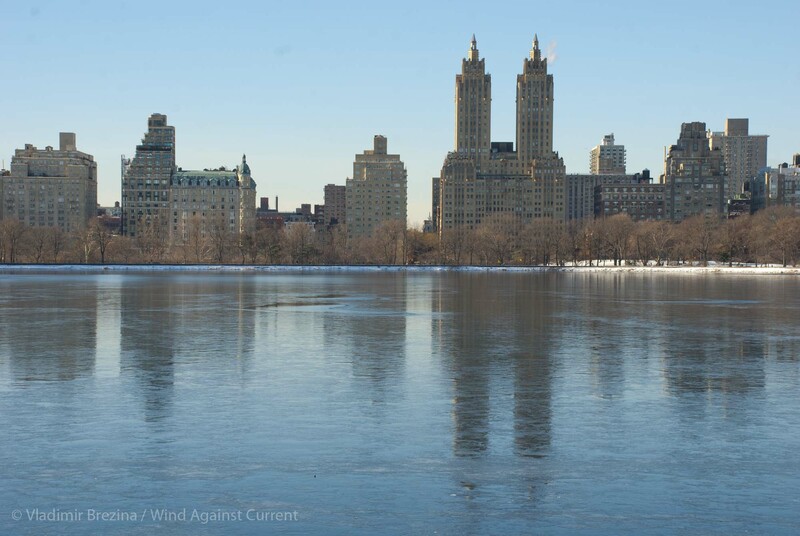 These are such beautiful images of winter in Central Park. 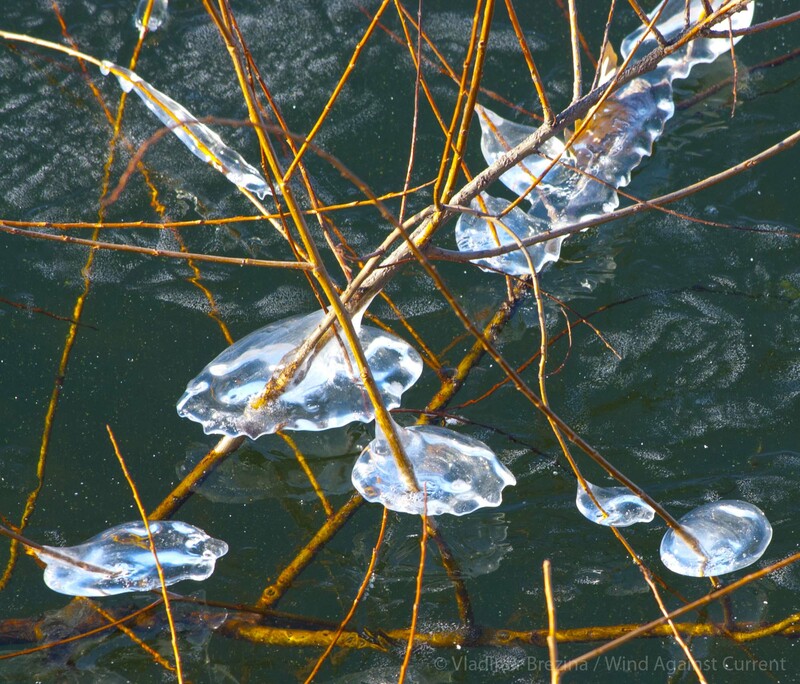 Nature makes its own art. You have a great eye for capturing it with your lens. 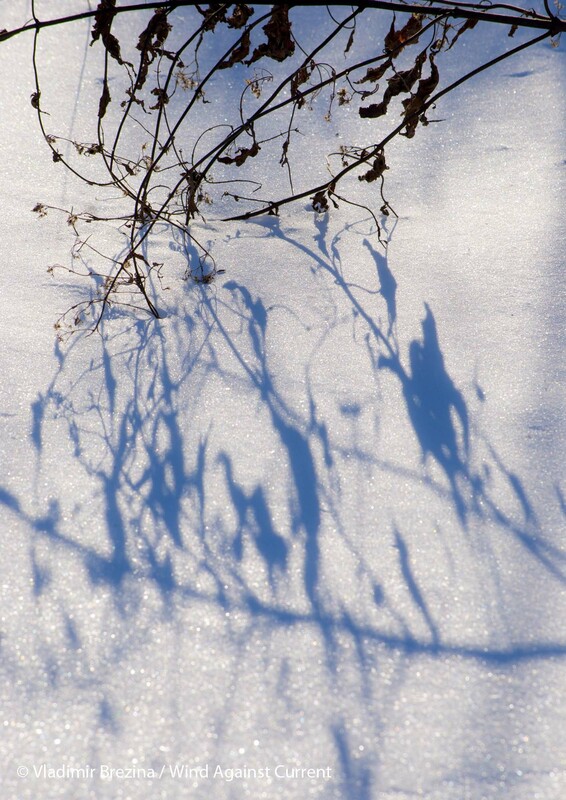 I love all of the light, shadows and reflections in your photos. 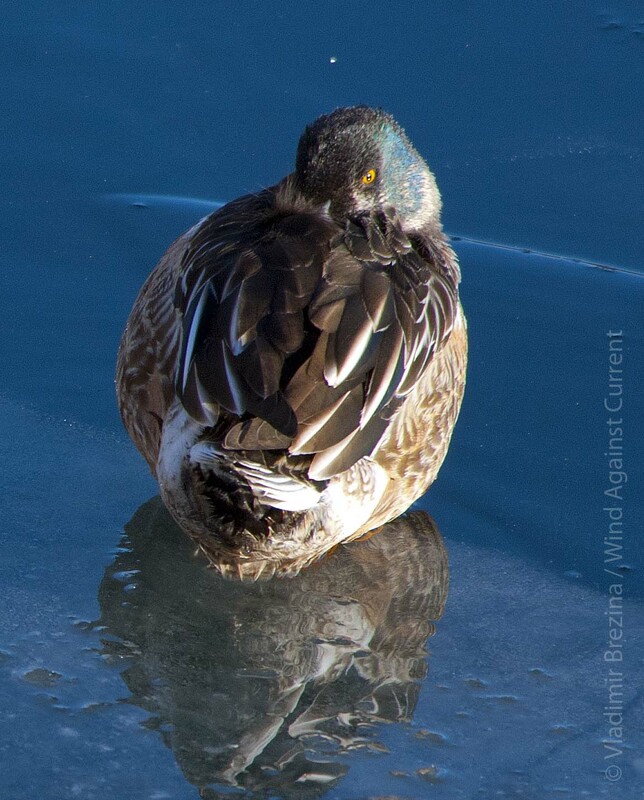 My cousins were visiting NY this week and took a lot of photos of people who looked as cold as those poor ducks. Going out paddling? Or is the Sound frozen? 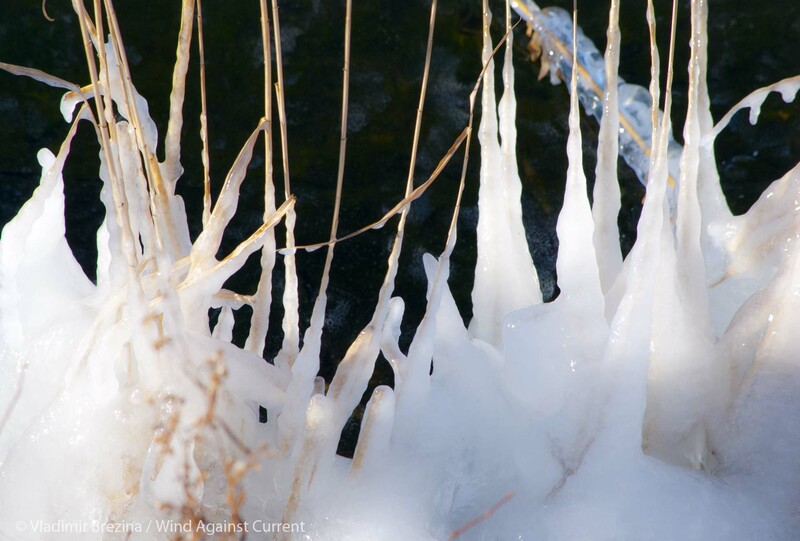 The Sound may not be frozen, but we are! 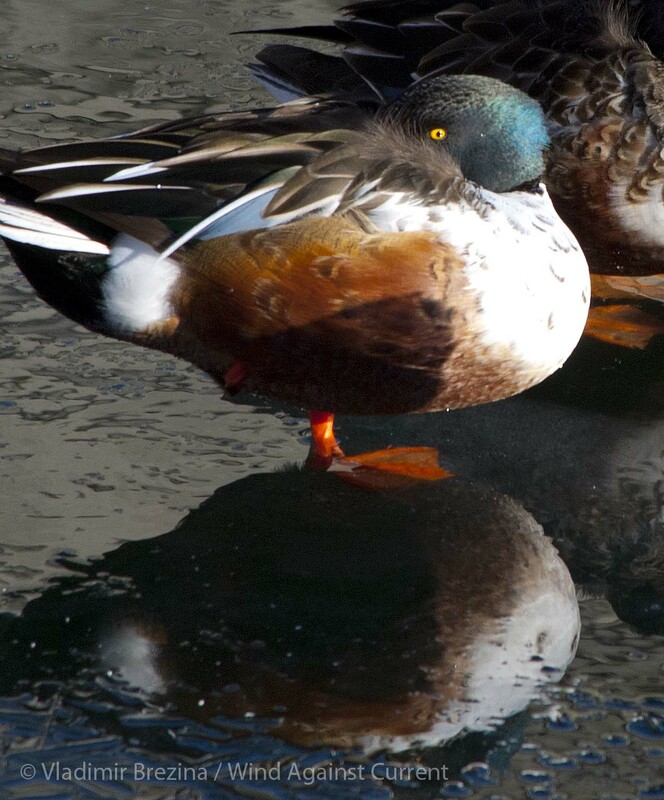 The black-headed gray duck behind #1 shoveler could pass for a scaup. If the light-colored bill has rings they’re submerged in duck soup. Sorry if I’m in too deep myself, but it’s a terrific grab shot, all your ducks in a row. 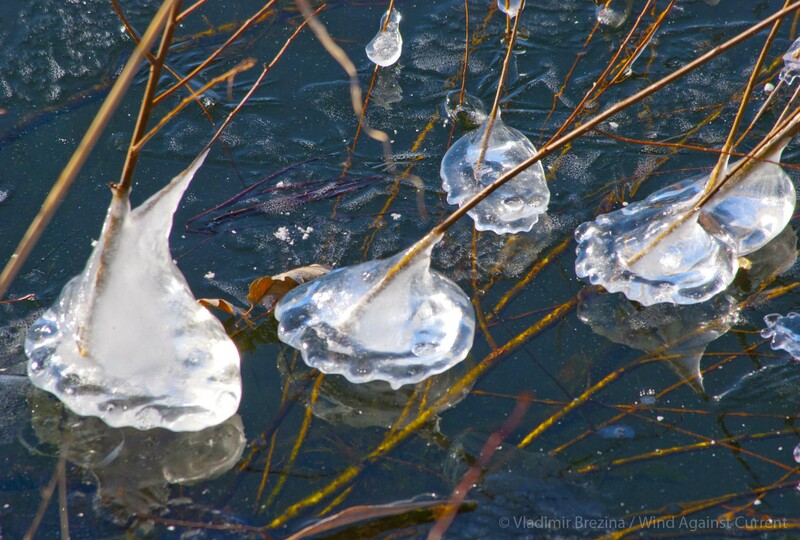 Wow, that ice is quite a sight, but I think my favorite are the ice cones around the grasses in the water. I don’t think I’ve ever seen anything like it. fantastic Vlad, wonderful photos, lyrical beauty! Happy New Year Vladimir – I trust you and your family have a fruitful and healthy 2014 – I am really glad to say I have seen nothing as cold as this this year. A most happy and productive 2014 to you too, Scott!! 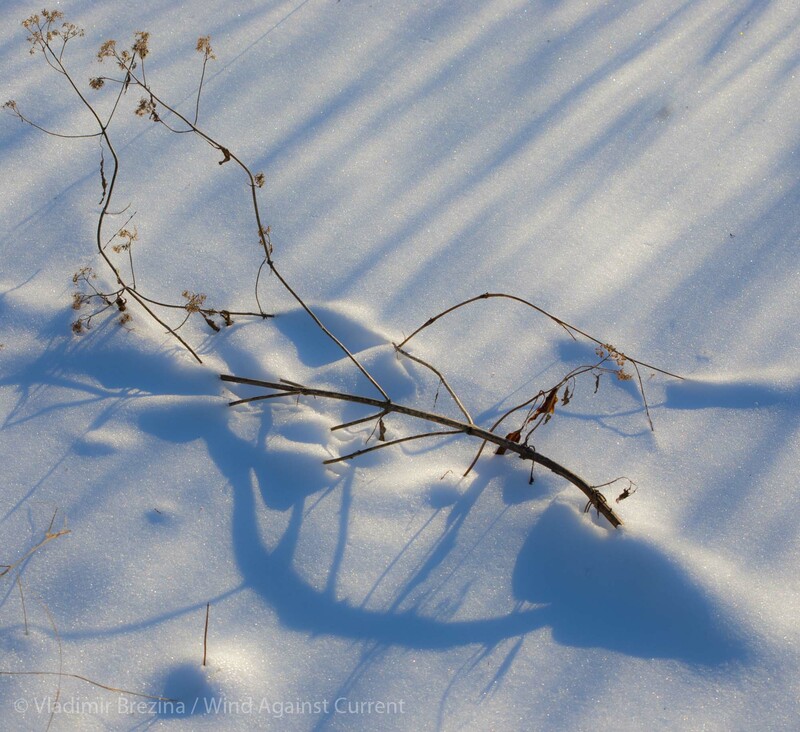 I won’t gloat – temps here are in the mid forties – because with the snow come bright, clean light and great opportunities for photography – I’m glad you took advantage! Have a fun New Year – both of you! From Florida to the icy cold in one week! Once again your photos are stunning. The little freezing “cakes” around the grasses are magical. 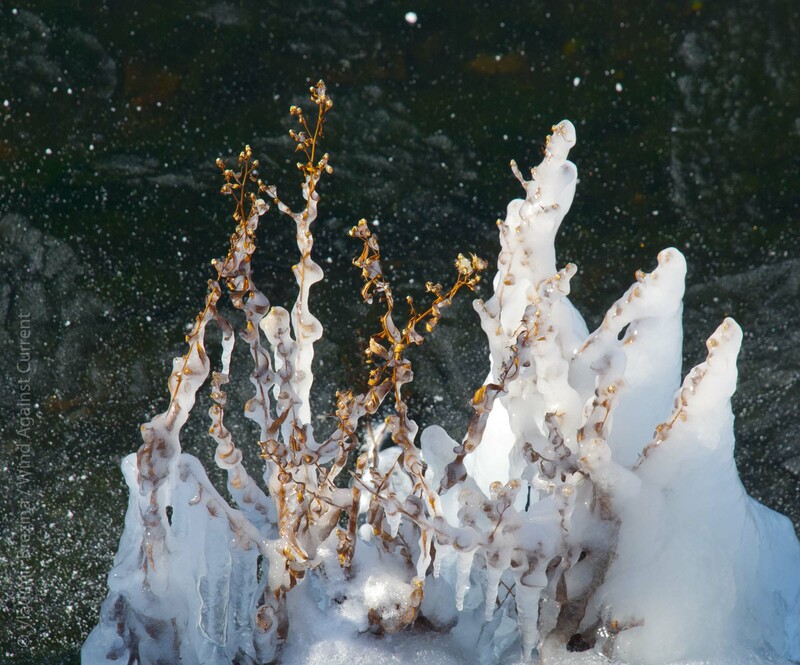 Reminds me of the growing bubbles in the icy sands at Swift Reservoir near Mt St Helens when the temps were about 15 F. Have to go find them in the archives now…..
Great group–I especially love the image you called “Ice 6”. 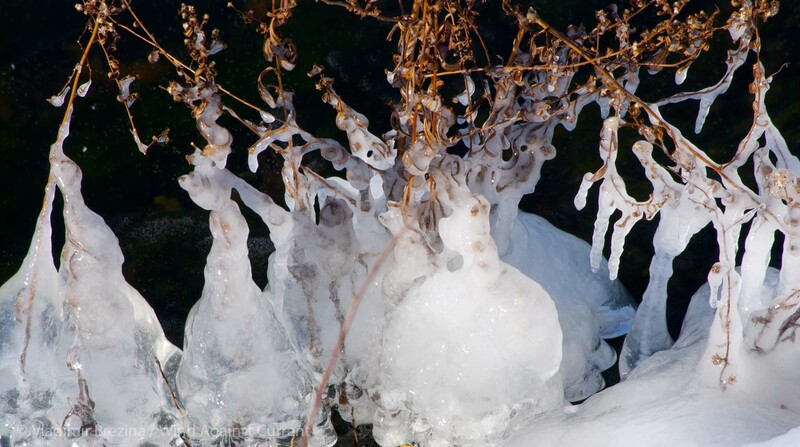 I love the shots of the frozen drips of ice….water put on pause and glittering beautifully in the low light. It all looks very magical, like something from Narnia! 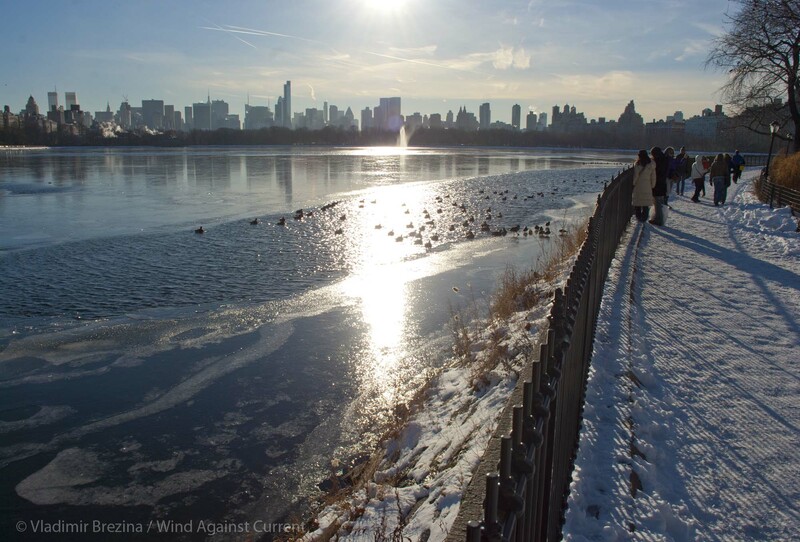 The Central Park Reservoir (where these ice sculptures were) is pretty clean—it’s a reservoir of drinking water, even though no longer used for that purpose day-to-day. Thanks so much for your nice comment, WG—very glad you like this post!! Rare days… now it’s all dark and wet… Thanks, Ailsa!! Sheesh! Even if the photos weren’t so neat you’d get a whole bunch of points for endurance. Up here it’s most been dark and damp. 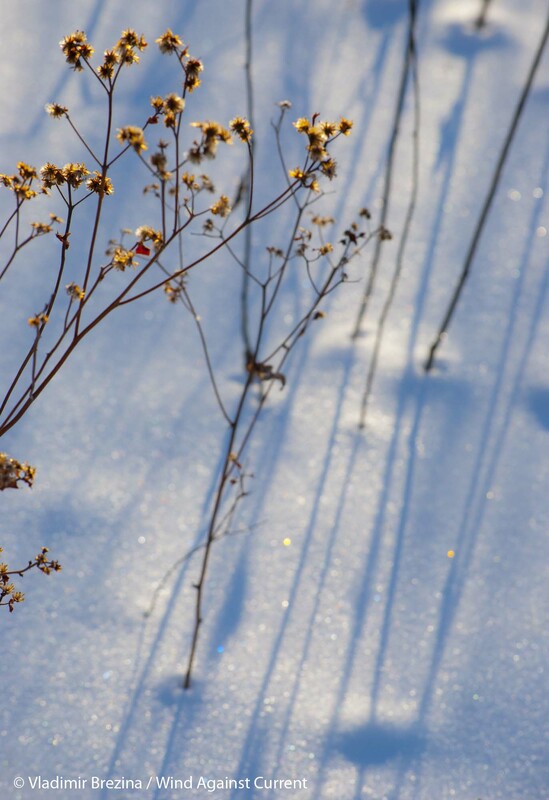 Hope you have more sunlit ice than we do!